High Street Baptist Church will celebrate its 134th church anniversary on Sunday, November 8th during its 10:30 a.m. worship service. Our special guests will be Rev. James E. Cook, pastor of St. Stephen Missionary Baptist Church of Winton-Salem, North Carolina, along with his choir and congregation. Rev. 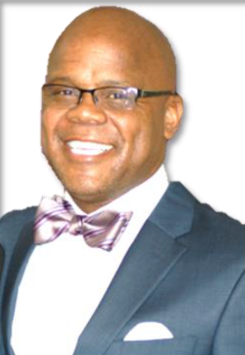 James Cook, native of Selma, Alabama has lived in a covenant relationship with his wife Erica since 1990. They are graced with three gifts of their union—two wonderful sons (Davonta and Jamarre) and a lovely daughter (Jaden). Pastor Cook received his primary and secondary education in the public schools of Selma and Dallas County, Alabama. Upon graduating from high school, he served honorably and faithfully in the United States. He then received his Bachelor of Arts in Religious Studies from Virginia University of Lynchburg, VA. He then attended the Samuel Dewitt Proctor School of Theology at Virginia Union University in Richmond, Virginia where he received his Master of Divinity Degree. Pastor Cook is now completing his Doctor of Ministry Degree, focusing on Transformative Leadership, at Colgate Rochester Crozer Divinity School. Pastor Cook faithfully served as Pastor of the Trinity Missionary Baptist Church in Roanoke, Virginia for ten years. He also served in the Valley Baptist Association of Roanoke Valley and as President of the Social Justice Department in the Virginia Baptist State Convention. He held the position of co-president of the Samuel Dewitt Proctor School of Theology at Virginia Union University Alumni Association and was co-founder of “The Commission Institute”, a body of pastors and academicians who are committed to enhancing the Universal church by presenting premier theological and practical lay and leadership training to local churches and surrounding communities of faith. On October 1, 2007, Pastor Cook became the pastor of St. Stephen Missionary Baptist Church in Winston-Salem, North Carolina. Since then, Pastor Cook has made a positive impact on the congregation, the community, and the state. During his first year at St. Stephen, he was selected to participate in the Wake Forest University Holy Land Pastoral Renewal Program. He was also a participant in Project Rising Sun, an initiative of the Fund for Theological Education. This program is a two-year leadership academy for gifted young pastoral leaders. An anniversary dinner will be served following the service in the Anchor of Hope Banquet Hall. 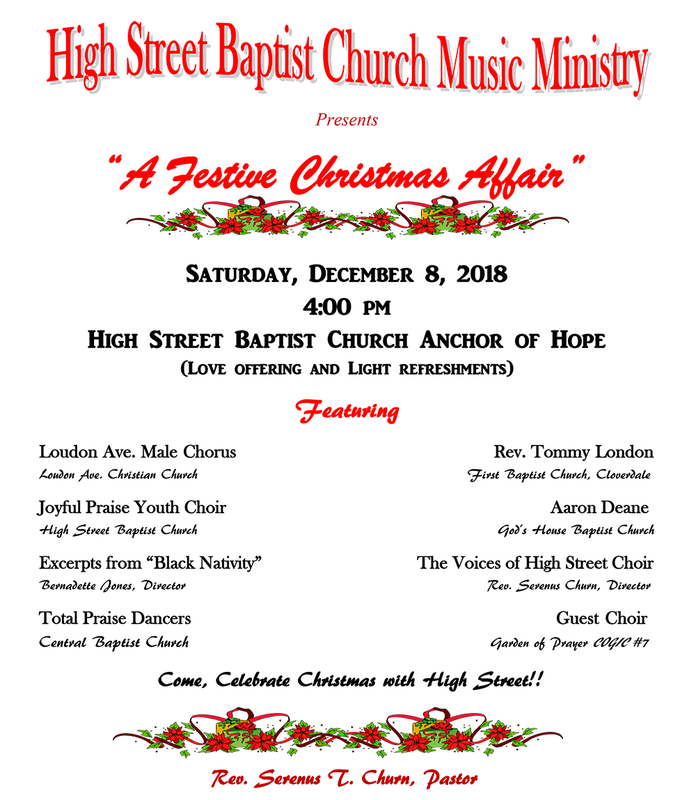 Everyone is invited to attend and help High Street celebrate its 134th Church Anniversary! Women “Got Moving and Got Energized”—a health and wellness workshop and third session of the heart-health research project, sponsored by The Roanoke Chapter of The Links, Incorporated. 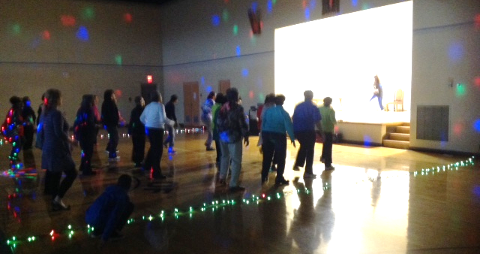 This workshop was held in the Anchor of Hope Community Center on February 20th. The Women’s Ministry partnered with The Links, Incorporated to bring their Signature Program—the HeartTruth Campaign® and “HeartLinks to Heart Health” project, to our community. The morning started with free health screenings and a nutritious continental breakfast, followed by two (2) educational and motivational presentations on healthy weight and physical activity. Link Verna Lewis, M.D., medical advisor for HSBC’s Health Unit and Onawa Allen, health coach of Virtuous Health Today, educated approximately fifty women about the heart-health benefits of moving. Both speakers gave practical suggestions on how to incorporate more physical activity into our daily routines and how to achieve a healthy heart and weight. 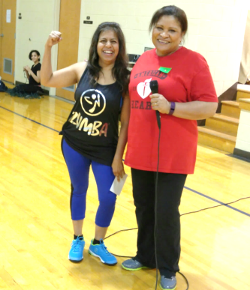 Then, certified Zumba instructor, Eunice Khetani, got women moving with family-friendly Christian Zumba. 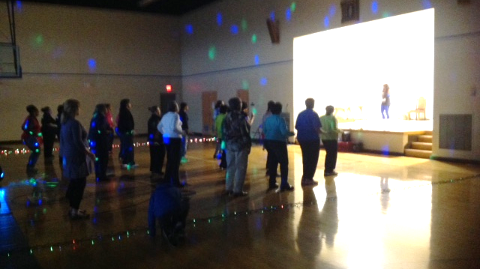 Women of all ages had a great time working up a sweat to fun and wholesome music and movement. To top off a great morning, Pastor Churn and First Lady Karen welcomed attendees, prayed blessings over the delicious, healthy salad bar prepared by Sister Dorothy Chapman, then closed the workshop with blessings on continued health to all. “The Roanoke Chapter of The Links, Incorporated is one of six (6) chapters throughout the nation that received grant funding to provide “With Every Heartbeat is Life” training here in the Roanoke Valley”, according to Rhonda Poindexter, Research Project Chairperson of The Roanoke Chapter of The Links, Incorporated (pictured right). 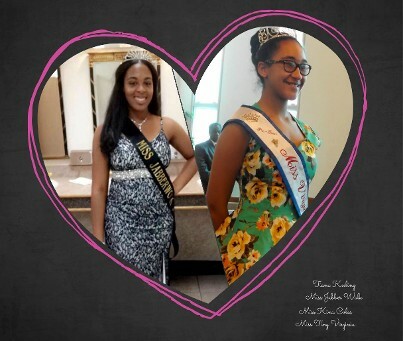 She continued to inform participants that this program is directed at increasing awareness of heart disease and prevention among African American women because heart disease and stroke remain the #1 cause of death among women, even though these diseases are largely preventable. Ms. Poindexter ended by thanking Pastor and First Lady Churn for promoting communication of this message in the community; thanking the Women’s Ministry and Pam Edwards, chair of the Women’s Ministry for its support of this project; thanking the presenters for communicating the message, and thanking the attendees for their participation! Many thanks also to our other partners—Kroger, Walmart, and WomenHeart of Roanoke Valley for making this program a success!